Whether you live in Gig Harbor, coming to visit, or looking to relocate. 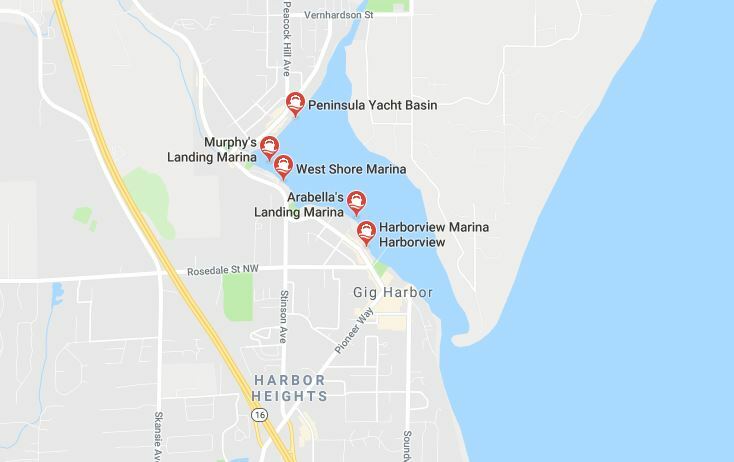 If you own a boat here’s a partial list of the many Gig Harbor marinas that may accommodate your day trip, overnight stay, a weekend in the harbor, or long term moorage. According to their website, Arabella’s can accommodate boats up to 160 feet and their docks are are equipped with 125V service at 20, 30, or 50 amps, or 250V service at 50 amps. Overnight moorage includes power and water and visiting boaters have access to their coin-operated pump-out station and on-site marine supply store. Their onsite facilities include restrooms, showers, laundry facilities, wheelchair accessibility, storage lockers, and secure gated entry. Hot, locally-roasted coffee, a nice fire (in appropriate weather), and menus from local restaurants within easy walking distance can be found in their lounge. For more information about Arabella’s Landing, visit their website. Gig Harbor Marina & Boatyard is centrally located and offers covered and uncovered slips, free parking and no long-term lease. They are also only marina in Gig Harbor with a full service haul-out and repair facility. Overnight guests can stay at either The Guest House, or on Fleet Suites @ the Boatyard. For more information about the Gig Harbor Marina & Boatyard, visit their website. Peninsula Yacht Basin is located at the foot of the Harbor. Just a short walk from the marina is Finholm Market, the place for all your beverage and snack needs, and if you prefer to dine, there is a great selection of restaurants within walking distance of your boat. The marina has outside slips up to 100 feet and covered moorage that ranges from 36 feet to 50 feet, all with power and water available. Bathrooms and shower are available for your convenience and gated, covered parking for tenants. For more information about Peninsula Yacht Basin, visit them on the web.